These spicy little muffin morsels are also affectionately known as "donut" holes because of their size and how quickly they disappear! Combine the flour, baking powder, baking soda, salt and cinnamon in a large mixing bowl and set aside. In another large bowl, whisk together the remaining batter ingredients. Add this moist mixture to the bowl of dry ingredients and whisk just until the two are combined. Don’t over-mix – the batter is supposed to be lumpy. 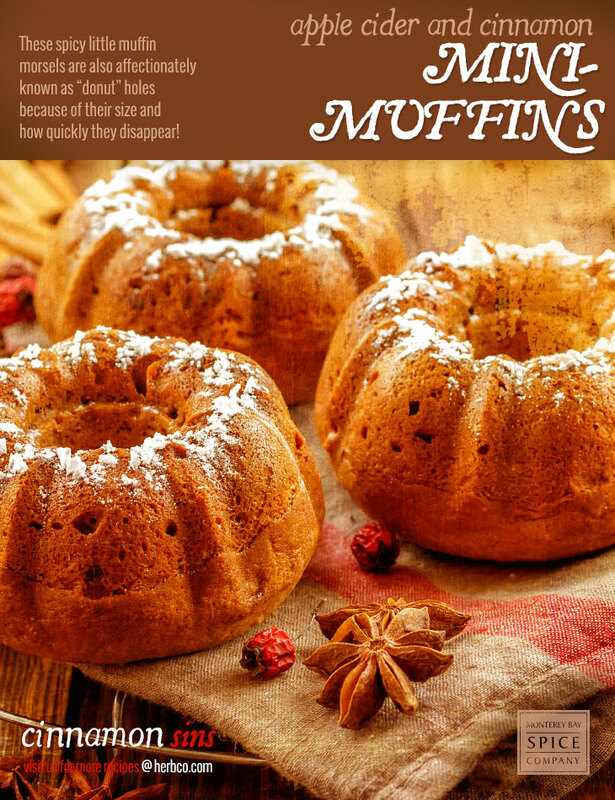 Using a tablespoon, fill each mini muffin tin hole ¼ of the way full with batter and bake for about 8-10 minutes. Bake an extra 2-3 minutes for mini bundt pan. The best test for doneness is still poking middle of muffins with toothpick, when they come out clean (without wet batter attached) they are ready. While the muffins are baking, melt the unsalted butter and mix the sugar and cinnamon together in a small bowl. When the muffins come out of the oven, and while they’re still warm, brush each with melted butter and roll in the cinnamon sugar mixture. Serve warm or at room temperature.